Jessica Sklar and Consuelo Gonzalez. When Jessica lost her voice due to being on a ventilator, Consuelo helped her communicate. Consuelo is deaf, but she is a skilled, professional lip reader. JENNIFER WING: This is Sound Effect on 88.5 KNKX, I’m Jennifer Wing. Our theme today is call of duty. In our darkest moments, when things are looking really bad, sometimes something unexpected happens that can give a person a little bit of hope and comfort. For Jessica Sklar, this came in the form of a woman who is called to help people by sharing an unusual skill that she has. 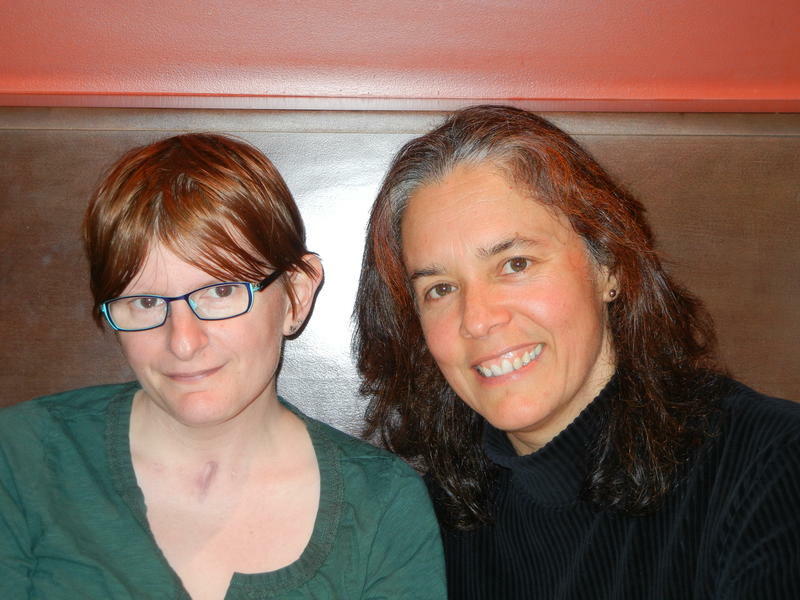 This person entered Jessica’s life when Jessica was in an incredibly fragile state. Jessica is a math professor at Pacific Lutheran University. In September 2012, when she was 38 years old, she woke up one morning and something was not right. JESSICA SKLAR: My eyesight was very compromised. Basically what was happening was my eye muscles were becoming paralyzed. JW: Jessica called a relative to let them know what was going on. JW: Jessica called 9-1-1, and went to the hospital. She was in an MRI machine getting tested to see if she did in fact have a stroke when she started to have trouble breathing. At first the technicians chalked it up to anxiety — lots of people get scared in these machines. But, just to be safe, they brought in the necessary equipment to insert a breathing tube if things got really bad. JS: And at that point my breathing just stopped completely. My lungs became sort of paralyzed, but I was able to breathe out, and I said. ‘I can’t breathe! I can’t breathe! Do it now, do it now, do it now!’ And then they sedated me, intubated me and I woke up paralyzed. JW: Jessica did not have a stroke. It took nine days for doctors to zero in on what was causing this paralysis. After various tests, it was determined that Jessica was frozen because she had been poisoned by botulism. She ate something bad. JS: I believe it’s the most toxic substance known. So, a very tiny amount can really do you in. JW: Her recovery was going to take months. She moved into a long-term care facility. The nerves hit by the toxin had to regrow. She couldn’t breathe on her own. To make breathing more comfortable, doctors took the tube out of Jessica’s mouth and gave her a tracheostomy — a hole cut into the base of her neck where a tube went in and a ventilator filled her lungs with air. Her arms and legs were paralyzed; she had no voice. The only part of her body she could move were a few toes on her left foot. JS: I would either nod with them or shake with them as if they were my head. Um, and also, my uh, friends and family would help me spell. So, they would sort of break down the alphabet. If they knew I wanted to say something, they’d say okay, ‘a through m’ and I would say yes or no. And we would narrow that down to a letter and do that one at a time. JW: She insisted on tapping out complete sentences. JS: It was a very slow process. I would sometimes fall asleep while spelling. JW: After weeks in this state, Jessica was able to move her lips. Staff noticed this and introduced her to Consuelo Gonzalez. CONSUELO GONZALEZ: I think when I came in and she was like, ‘Who are you, another person.’ And I introduced myself and said what I did. JW: Consuelo is a professional lip reader. She can understand what people are saying by the shape their lips make. CG: She said, something like ‘Oh, my god, finally!’ or something. You know, I can’t remember exactly. She was just astounded and relieved to finally be able to communicate. JS: It was just like the heavens opened up. Suddenly, I could have a conversation with someone after all of this time. CG: I know from personal experience what it is to have a challenge communicating, because while I can speak for myself, I can’t hear for myself. JW: Consuelo lost her hearing when she was a child. No one could figure out why. It started to fade when she was four years old. And by the time she was eight, she was profoundly deaf. She learned how to read lips both on her own and by watching her mother, who was also deaf. CG: I know intuitively, how frustrating and sometimes isolating it can be for the patients if they can’t communicate. Now they’re on the other side, they can hear everything that’s going on, but they can’t communicate. And, I can’t hear anything that's going on, but I can communicate. So you put us together and it makes it work. JW: For a few hours each week, Jessica gave her toes a rest and was able to have long conversations with Consuelo. JS: By this point I believe I developed a reputation for being really obstinate in the hospital. JW: Through Consuelo, Jessica asked the doctors and nurses questions about her care she had long wanted answers to. Jessica also talked to Consuelo about the vivid dreams she was confusing with reality. JS: I told Consuelo we were dead. I told her we were in Texas. I told her I didn’t have any legs. CG: It was the drugs. And usually, I would be able to jump in and say, ‘Well, hmm, let’s think about that.’ And she’d be able to figure it out that that wasn’t what was happening. Sometimes these are the conversations you have to have when someone is not all there. But at least they’re understood, they’re validated and they can let go and continue with their healing process. JW: Because Jessica was on so many different medications she’d forget what the staff had told her, even about aspects of her care that were repeated multiple times. There was one thing that terrified her, something she could not make any sense of. She says staff would come in, wake her up and cut her off from her oxygen. And, then, they’d ask her to take a deep breath. JS: And it would be like, ‘I don’t understand, there is no oxygen to breathe how can I breathe when you’ve disconnected my breathing apparatus?’ But, you can’t say any of that. You can’t ask any of that. You’re just woken up and your oxygen is removed. JW: The medical team wasn’t trying to kill Jessica. This was a routine test to see if she was ready to be weaned off the ventilator. JS: With Consuelo, I could say. ‘I don’t understand this. What is this? Why is this happening? How am I supposed to breathe when there isn’t any oxygen?’ And she was able to communicate to the medical staff, ‘She’s not trying to be difficult.’ And that was just one of, I think, many things where it’s like, I don’t know what’s happening, please have them explain it. JW: There are other ways for Consuelo to earn a living reading lips, but she says explaining to a vulnerable person what’s happening to them in a hospital and helping them separate horrible dreams from reality is the most rewarding way to use her unique skill. JW: After four and a half months in the hospital, Jessica was eventually taken off the ventilator. Being bound to a bed for so long made her incredibly weak. She could touch her smartphone's screen, but she didn’t have the strength to press it hard enough to send a text or to make a call. She had to learn how to walk again, how to eat, how to talk. A small scar above her clavicle is a reminder of what she went through. Jessica eventually went back to work as a math professor. After her experience she wrote a new living will. One thing she added is that if she ever becomes incapacitated like this again, she is never to be left alone.